We want your home to be as comfortable as possible during the hot summer months and beyond. That’s why the Austin Shade Team is proud to offer delivery and installation of our custom solar window screens and roller shade screens in Georgetown. Customers love our team, from the friendly smiles on our faces to the unmatched services we provide, the Austin Shade team has what you need to stop the Texas heat and make your living situation as pleasant as can be. We are proud to offer measurement, delivery, and installation of our premier custom window screens to your city for no additional cost. 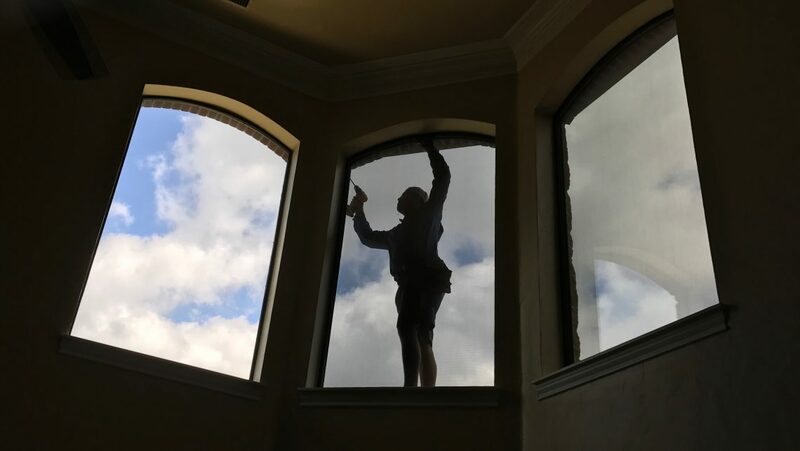 We can install our custom window screens on every window of your home to maximize its energy efficiency while protecting you from the sun’s heat and harmful rays. Here are some examples of our custom arched solar window screens. Starting from left to right you got a 35 by 70 inch rectangular window that opens up and down. On top of that rectangular window you have what we call a quarter Circle. That’s because the window is shaped like a quarter Circle. Then to the right you have a 35 by 35 inch square window. And on top of that you have another quarter Circle. To the right of these groupings you have some tall 83 Inch Tall and narrow, 25 inch in width, full arches. To the right of that picture, that grouping of three windows, that’s two very tall 96 inch height, but narrow, 25 in width half arches. That’s two half Arch custom solar screens around a tall rectangular 35 by 96 in window. Our screens can replace your current bug screens while also matching the paint scheme of your home. They are cleanable, simple to maintain, and transparent enough that you can see outdoors without having to feel the heat of the blazing Georgetown sun. This picture shows me standing outside of some 90% solar window screens. That top painted glass there, top of my ladder, it does not have a solar screen on it. Look towards the bottom of the picture and you will see what 90% shade looks like, compared to, against 0% shade. 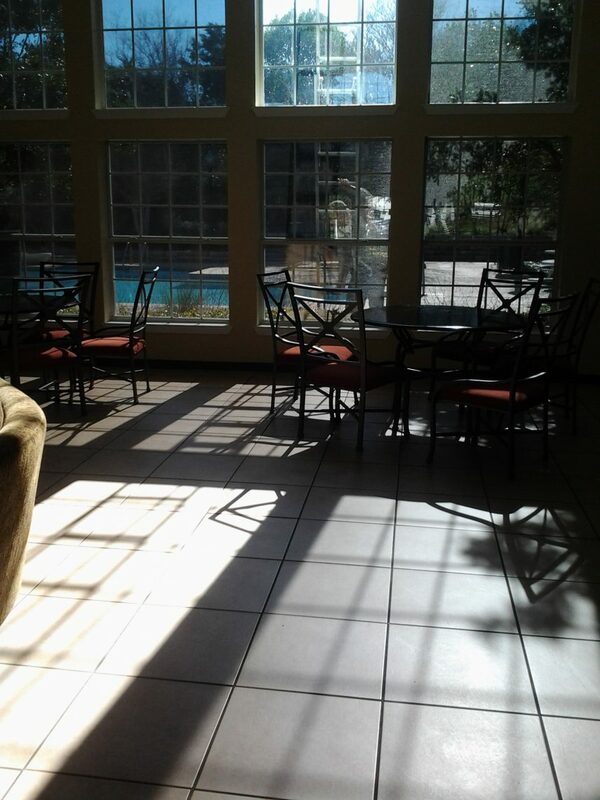 Looking at that tile floor to the left, that rectangular shaped area, that’s 0% shade. Then to the right, that rectangular shaped area, that is 90% shade. This is a perfect illustration to show what you get out of a 90% shade custom solar screen. I have posted many pictures of solar screens that you can take a look on this website. This is a perfect illustration to show you that the 90% solar screen fabric does not make the inside of your home like a cave. Without ever seeing a picture like this, you naturally think it’s going to cut out 90% of your view, and 90% of the light. While it is 90% shade screens, meaning 90% of that surface area is covered with our solar screen fabric, that the open area of the fabric represents 10%. It is remarkable how well you can see through the fabric. The Austin Shade Team is your answer for Solar Shadees. Equally as remarkable, is that it is hard to cut out light, you’re still going to have some buffered light. So while you’re covering up 90% of the surface area with fabric, it is quite incredible how much light actually comes through. The light that has been filtered through the small openings of the solar screen fabric. This picture here is a great one to show you what the 80% solar screen fabric looks like. So the window to the right and the window in the middle both have our 80% solar screens on them the window there to the left does not have a solar screen on it. Look how well you can see my helper Mike there standing up on the ladder. We are not careless, he is standing on the top of a ladder with a stabilizing arm on it so it’s not all that bad and made for a great picture. This picture is just absolutely awesome, as it shows how well you can see through the 80% solar screen fabric. It’s a huge worry for people, wondering if our 80% solar screens are going to limit their visibility. Yes while they do make a little dark, that’s what the purpose of the solar screens is for, you can still see through it very well. My explanation that I tell people is that you can see through it about as well, maybe a little bit less, but about as well as that of your current bug screens. The reason is the weave of the fabric isn’t even weave with large threads and large openings. Because of those large openings, you get this great outward visibility. You know the screen fabric is there, but it does not distort your visibility at all. Now the 90% fabric does distort outward visibility a bit more. But 90% fabric cuts down on your visibility here by half. Because here you are seeing through 20% of the fabric, but that 90% fabric you’re only seeing through 10% of it. 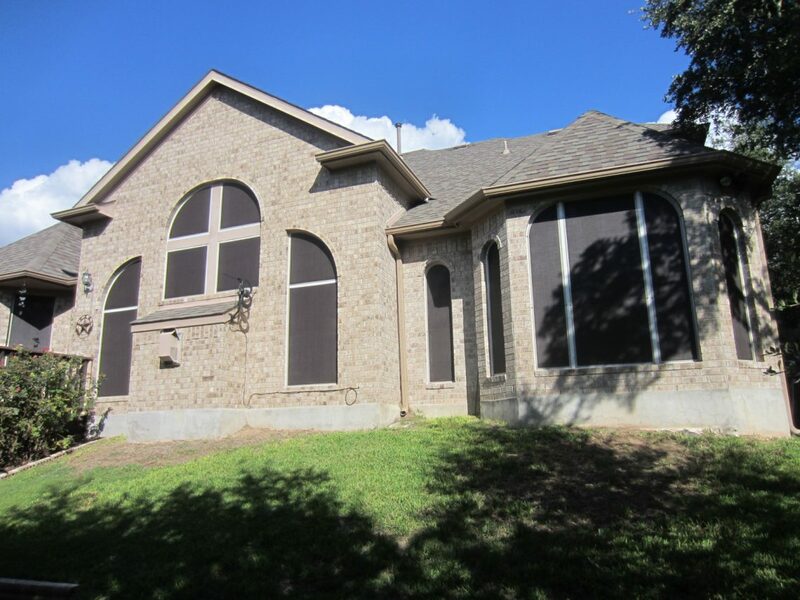 Just call the Austin Shade Team today to get started with solar window screens for a comfortable home you will be proud to look at and enjoy. Roller sunshades, also known as sun shades for your patio, are the perfect supplement or even alternative to blinds (if you don’t mind sacrificing a little bit of privacy). Our custom patio roller shade screens can be custom fit to your window, gazebo, or other exterior space, and we can match the color of the fabric to that of your solar window screens if you choose to have both options to fully maximize your home. Here’s a great home that we installed 6 exterior patio roll Shades at. The type of fabric that we used, was our chocolate brown, 90% solar screen fabric. It is the same solar screen fabric that we make our solar window screens out of. We can make our roller shade screens out of the chocolate 90% and 90% black fabrics, that we make our solar window screens out of. 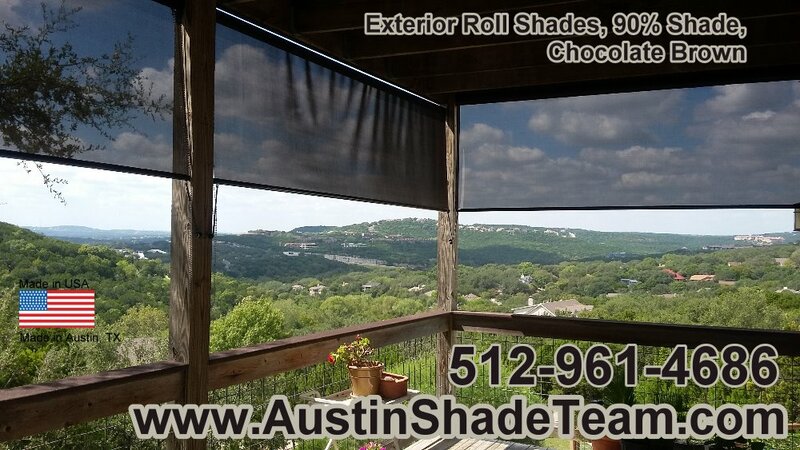 Get the premier cooling and efficiency option today with our custom exterior roll up shades from the Austin Shade team.